In late July 1998, a painting by Jacopo Zucchi, “The Bath of Bathsheba”, returned to its rightful owner, the Galleria Nazionale in Rome, Italy, after it had graced the walls of the Wadsworth Atheneum Museum in Hartford, CT, since 1965. This may seem like stale news but the story of the return itself exceeds the boundaries of time. May 25, 1997: The Hartford Courant reviews the decision by the Wadsworth Atheneum to restitute the “Bath of Bathsheba” by Jacopo Zucchi to “its rightful owner,” the Italian Government, “as it should be.” The painting hung at the Wadsworth since 1965. Soviet troops had stolen the painting from the Italian Embassy in Berlin at the end of World War II. According to the journalist, the museum had no idea of the stolen origin of the painting at the time of its purchase. April 29, 1998: Christopher Knight of the Los Angeles Times expounds at length on the Carravaggio exhibit which resulted from the settlement with the Italian government noting somewhat surreally that the Italian government “offered an impressive loan” of paintings “in compensation for Hartford’s loss.” Extraordinary! June 28, 1998: Stevenson Swanson of the Chicago Tribune reviewed the circumstances under which the Zucchi painting was returning to Italy. The word “restitution” is replaced by the word “settlement”, a settlement that the art world applauded. The director of the Commission for Art Recovery, Constance Lowenthal, hailed the settlement “as a wonderfully creative solution” which could serve as a model for other US museums. In other words, a qualified version of restitution is no longer a restitution. Or, was the Wadsworth solution a “restitution” or something else? Still, new details emerge about the circumstances under which the painting found its way in the hands of the Wadsworth. Presumably, Soviet officers in Berlin had sold the painting to an Italian businessman who then sold it to a Parisian art dealer. Once at the Wadsworth, after the Italian government made initial claims for the return of the painting, the Wadsworth had offered to sell it back to Italy, an odd way of acknowledging that it had acquired a stolen work of art. Peter Sutton, the Wadsworth director who engineered the “settlement” qualified it as a “pretty good deal and… the right thing to do.” The Italian government official who headed the negotiations expounded on how, for love of art, this arrangement served as “an enlightened example” how to recover lost works of art without going to court. An odd way for the rightful owner to describe a situation that should have placed it in the driver’s seat from the get-go. After all, the Wadsworth owned a stolen piece of Italian cultural property that had originated from a State-owned museum in Rome. July 17, 1998: in the travel section of the New York Times, Michael Kimmelman provides a history of Jacopo Zucchi’s painting. We learn that, in 1908, the Galleria Nazionale d’Arte Antica in Rome lent the painting to the Italian Embassy in Berlin and that “Russian officers” had offered the painting for sale in 1947. After the purchase of the painting by the Wadsworth, the Italian government began to press for the return of the painting. Nothing happened until Peter C. Sutton became the director of the Wadsworth in 1996. March 8, 2002: Christopher Knight of the Los Angeles Times, commenting on the return to the Krakow-based Czartoryski family of a late Medieval tapestry, contrasted the behavior of the Los Angeles County Museum of Art (LACMA) with that of the Wadsworth, wondering why LACMA stowed away the tapestry out of view of the public while the Wadsworth had shown the painting until its return to Italy. He did note, however, that “no credible argument can be made for keeping stolen art.” Agreed! August 13, 2002: An online editorial posted by “Antiques and the Arts online” announces the creation of a Nazi-era provenance project at the Wadsworth funded by the Chase Family. Reference is made to the Zucchi painting, the fact that the Museum had acquired it in good faith from a Paris art dealer, who had obtained a lawful export license to ship it to the United States in 1965. The last comment is a subtle hint that the French government acquiesced in the legitimacy of the acquisition, thus adding credibility to an untainted provenance for the Zucchi painting. Strangely enough, the editorial points out that it wasn’t until 1997 that the Wadsworth acknowledged the looted origin of the painting. January 27, 2004: An undergraduate student posts art-historical information about the Zucchi work, including the battle over its attribution to Zucchi as opposed to his mentor, Giorgio Vasari, which took place in 1925. April 14, 2009: Using as a pretext a presentation at the Wadsworth Atheneum by Nancy Yeide, head of curatorial records at the National Gallery of Art in Washington, DC, on Hermann Goering and his voracious collecting habits, Daniel D’Ambrosio provided some additional details about the Zucchi’s travails through Europe prior to reaching Hartford. The Paris art dealer who sold the work to the Wadsworth was François Heim did not disclose how he came into possession of the work, declaring simply that it had come from a private Italian collection. We still do not know exactly what happened in Berlin in 1945, the identity of the seller to François Heim, and the details of the discussions between successive Italian governments and the Wadsworth over a thirty-two year period. 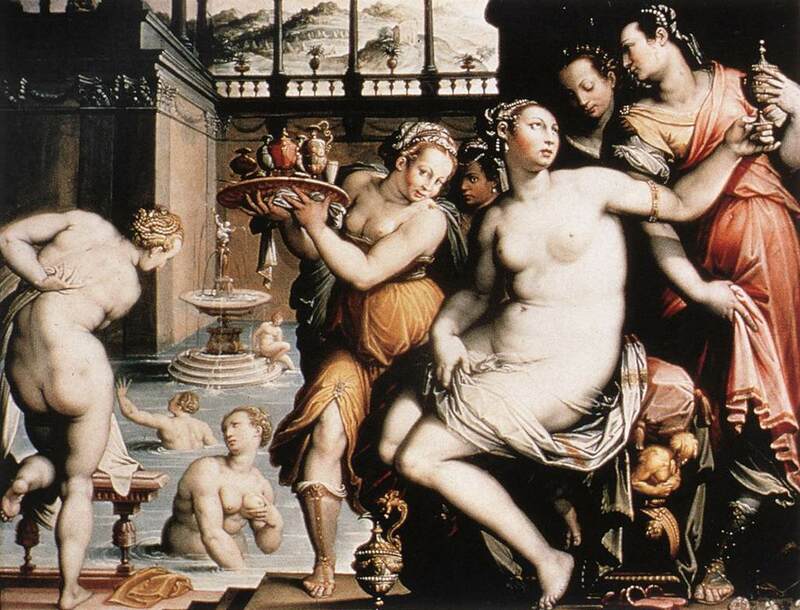 “The Bath of Batsheba/Bethseba”, by Jacopo Zucchi, an oil on canvas, painted in or around 1573, was loaned to the Italian Embassy in Berlin in 1908. In 1925, the painting was convincingly attributed to Jacopo Zucchi. Loaned to a Berlin museum in the 1920s, Federico Zeri, a noted Italian art historian, spotted the painting. As Allied troops choked the last pockets of resistance in and around Berlin in late April 1945, Soviet troops stormed the Italian Embassy, ransacked and plundered it. One of the items “liberated” by Soviet troops was the Zucchi painting. Soviet soldiers sold the painting to a sleeping-car train employee, who, two years later, took it to the Italian Embassy in Paris in 1947. The Italian government was unwilling to come up with the funds needed to buy back their own property, although it is uncertain whether or not the Embassy personnel knew that the painting belonged to their government. The year of sale to Heim is not indicated, although François Heim is one of the most important antique and old master dealers in Paris up through the 1970s. The Wadsworth acquires the painting from him in 1965, for which Heim obtains a license to export the work out of France. It is not until 1970 when Federico Zeri visits the Wadsworth and spots the Zucchi, associating it with the painting that he had last seen in Berlin before the war. The Italian government initiates its claim for the return of the work as its rightful owner. The Wadsworth responds with an offer to sell the painting back to the Italians, arguing that it had bought it in good faith. The dialogue reaches a dead end until Peter Sutton’s arrival as director of the Wadsworth in 1996. Thirty-one years have now elapsed. In that intervening period, the Italian government has modified its tactics on how best to recover works and objects of art looted from its national collections during the Second World War. We have no way of knowing what transpired between the Wadsworth and Sgr. Osio. One thing is certain: the Wadsworth did not restitute the Zucchi painting to Italy. The Italian government, on the other hand, has adopted a strategy for the return of looted State-owned works which does not apply to works plundered from individual Italian citizens and whose works are in US collections. The Gentili family’s travails with US museums like the Princeton Art Museum and the Italian government are a case in point.